[Game Dev] GameMaker:Studio goes Steam! What a surprise and smart deal from YoYoGames! Steam, the biggest online portal and community for downloadable games (there are approximately 4 million users online each day) opened their shop for applications just recently. And those YoYo guys managed to get GameMaker:Studio added to the list of the first few apps that are prominently featured on the Steam website! Even better they got it added to the Steam Workshop too. This means that GameMaker:Studio owners can upload their games to the Steam Workshop and get them seen and played by several million people! That's just amazing! You can download the (feature limited) free version of GameMaker:Studio from the Steam store and play all games from the Workshop for free. Of course you can upgrade your free copy of GameMaker:Studio to the Standard or Professional or Master edition if you want, just as you can do from the YoYoGames website. But even games created with the free version of GameMaker:Studio can be uploaded to Steam's Workshop! All customers who bought GameMaker:Studio from YoYoGames directly receive Steam keys to unlock their modules for the Steam version of GameMaker:Studio too. So no additional costs at all but just more features (upload to Workshop, play all Workshop games, sync your stuff with Steam's cloud)! Pretty cool and hopefully a great marketing move for YoYoGames! Oh, before I forget: there's a 10% discount on each GameMaker:Studio package on Steam currently, running til 9th of October. So if you want to join the fun of coding games with this great tool now would be a good time to start and jump the boat! [Game Dev] Proper integration of HTML5 games on my site! I love the GMC and the huge amount of information you can get there. And the smart chaps of YoYoGames too. Mike Dailly just posted an information about properly integrating GameMaker:Studio games into nearly any blog. And guess what - it's also working for TOWeb! Have a look over here at my special PenAndPaper game page or use the top menu entry of PenAndPaper in the Games menu. No just kidding, back to real life work on monday - and that's fun too! It took some time but finally my reported bug in GameMaker:Studio was fixed. So I uploaded a first version of my rogue like maze generator. 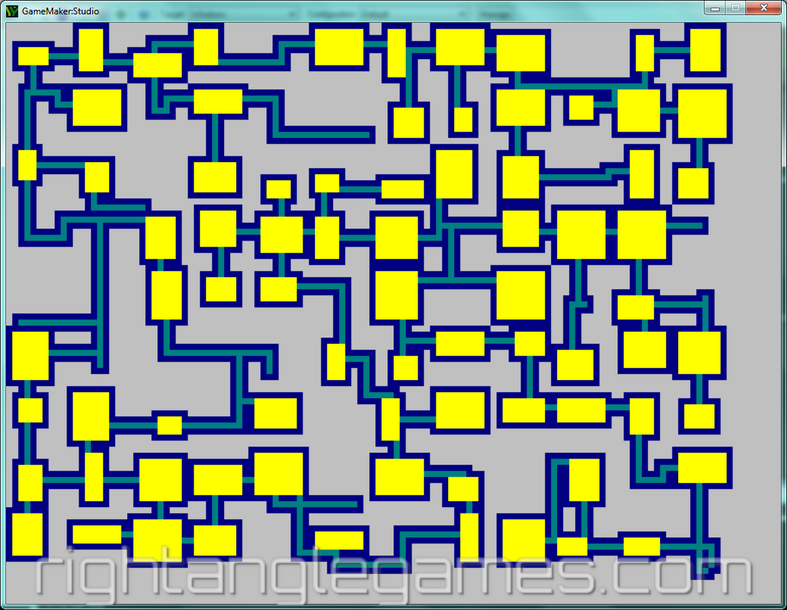 Use the cursor keys to walk around, press Space to generate a new maze. You can have a play here. Some feedback or questions are appreciated. [Games] Steam summer sale - I could resist! Legend of Grimrock, because I love those old school RPGs. Although I haven't played Dungeon Master from FTL for very long, I played through all old Might and Magic RPGs (up to version 5 or 6) which were pretty similar. Most of the Indie titles I already owned so they weren't really interesting for me and finally I wasn't interested in all those AAA titles either. No reason to spend money on that kind of games. I worked a bit on my GM:S remake of Back to the past and made some pretty satisfying progress. The basic jump'n'run part is working properly. Also the auto tiling of the platform blocks is working. Next will be the timing of the animation, not sure if I use the builtin step mechanism (GM:S uses a fixed frame rate, so the update or step logic would be called 30 times a second by default). The other alternative is the newly added delta variable of GM:S which contains the delta value in milliseconds, similar to Slick or other game engines with a time based update loop. Then I will add the other features (bots, shooting, acid, collectables, exit) one by one. As a little teaser and proof I added a little screenshot of Back to the past running in a web browser, made with GameMaker:Studio. [Website] All machines full stop! To my surprise the developer told me he's already thinking about adding this and other more "dynamic online" features! How cool is that? I guess I will just wait a little bit longer and continue using TOWeb because it's usage is dead simple and more than comfortable compared to Wordpress or Joomla. AAAND I don't have to convert all or most of the content of my existing site! My plan was to publish a first HTML5 alpha version of "Pen and Paper" just to demonstrate the level generation, minimap and wandering around. 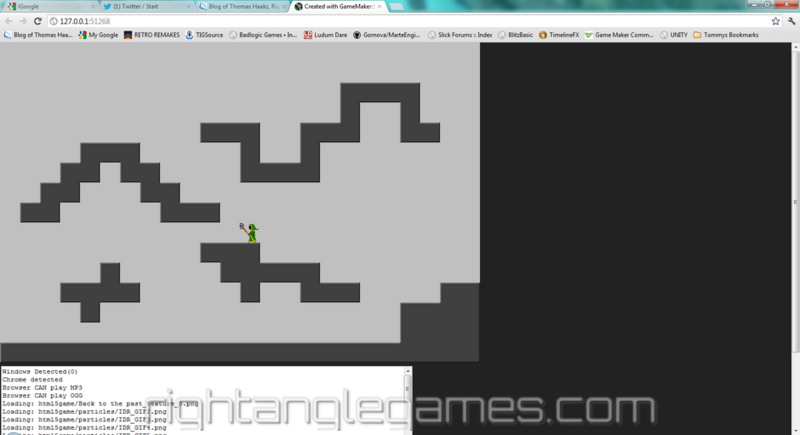 Unfortunately I found a GameMaker:Studio bug which breaks the HTML5 build (but works under Windows). So I'll have to wait until this bug is fixed by YoYoGames. Should be fixed in one or two weeks if they keep their current bugfix release timeline. To get more used to GameMaker:Studio I started porting of some other games of mine (Back to the past and 10 seconds). First challenge was the tweening stuff I use for the splash screen of my games. Luckily several topics on the GMC cover tweening and I quickly had a running solution. It's a mixture of Marte's tweening code and some GameMaker approaches. Working fine! The GUI is another issue, especially for 10 seconds where I used a cool BlitzMax framework that allowed nice movements of complex GUI dialogs and stuff like that. But I'll get that sorted with GameMaker:Studio, I'm pretty confident here. My current idea is to make the content of this site available via my "old" domain http://www.haaks.net and move http://www.rightanglegames.com over to Wordpress and redo the website from there. So I could take my time, get used to Wordpress and rearrange the contents and still add new blog entries faster than before, add mobile support (browsing from your smartphone or tablet) and so on but still allow visitors to read and search my old site. [Game Dev] Random level generation working! After twiddling with several level generation algorithms (and their source code in several different programming languages) I finally settled down with a simple verbose description and coded it all on my own (using GameMaker's builtin GML). Divide the map into a grid (Rogue uses 3x3, but any size will work). Give each grid a flag indicating if it's "connected" or not, and an array of which grid numbers it's connected to. Pick a random room to start with, and mark it "connected". While there are unconnected neighbor rooms, connect to one of them, make that the current room, mark it "connected", and repeat. While there are unconnected rooms, try to connect them to a random connected neighbor (if a room has no connected neighbors yet, just keep cycling, you'll fill out to it eventually). All rooms are now connected at least once. Make 0 or more random connections to taste; I find rnd(grid_width) random connections looks good. Draw the rooms onto the map, and draw a corridor from the center of each room to the center of each connected room, changing wall blocks into corridors. If your rooms fill most or all of the space of the grid, your corridors will very short - just holes in the wall. You can see an example in the screenshot to the right. Click on it for full size. Oh, it's this time of the year again? Yup, I'm thinking about redoing the website (again). And I'm thinking about switching to Wordpress (again). We'll see how far I come this time. A local version of Wordpress using XAMPP will be installed on my laptop and I will use that to create and fill the initial Wordpress version of my site. You and me will find out. [Game Dev] Another competition, maybe another game?! Over at http://www.64digits.com they are having a contest which started 1st of May and ends 2nd of August. It's about creating a RPG. See here for details. The contest is still open for joining (you need to join the forums and announce your intent in the above topic as a comment). I decided to give it a try, mainly because I always wanted to code a little roguelike game and second because I needed a reason to play around with Game Maker and third because it's a family friendly time span of 3 months. Although I planned to give libGDX a try I couldn't motivate myself. Instead I downloaded Ludum Dare 23 entries made with Game Maker, I read my two Game Maker books, I browsed the Game Maker forums and updated my Game Maker:Studio beta every time the YoYo Games guys released a new beta. Amazing, isn't it? More than 1400 games created in one weekend! What's even better is that most of the competition entries (not the jam entries which lasted one day longer) come with full source! So should you ever think about coding games yourself (and honestly, why shouldn't you?) there's a lot of source code to learn from right here!!! Have fun downloading and browsing the code, learn what you can and improve your knowledge! Oh, and don't forget to play a game in between ;-) Many of them are really worth it! I downloaded several Game Maker games to learn from as I intend to give Game Maker Studio a test run. See my post above. [Game Dev] Ludum Dare weekend! The next weekend (20th to 23rd of April) is Ludum Dare again. Create a game in 48 hours (72 hours for the jam) with a given theme all on your own. But maybe YOU want to jump in? It's just a few minutes for registration and off you go! Spriter is a 2D animation tool. It's currently a beta version and looking for funding via Kickstarter. Because it is such a powerful tool, a great idea and a downloadable working beta as proof of concept is also available the funding of the project is already successful (at the time of writing they achieved over 40,000$ while asking for 25,000$)! I became a backer a few days ago and thought about asking for a libGDX (or indeed any Java) binding. Because in general the magic behind Spriter is just XML files describing the transformation of the separate sprite graphics with some timing/frame information. Nothing every game coder could create in a few weeks except the UI tool of course. A good interface does take time (that's why they are asking for funding, doh!). Luckily an implementation already popped up over at the libGDX forums (here). I think we can assume that even enhancements and extensions of the Spriter XML format will follow in short time frames now that some base code for libGDX already exists. The great thing is you can record your life playing! Changing notes, chords, distortion with your fingertips and save it all as a wav file. A few minutes ago I converted my "demo" track to mp3 format and here it is. [Game Dev] libGDX - how did I miss that one? Just a few days ago I talked with a friend about libGDX. My memories were "some Android lib for Java, also running on the desktop". But now I own an Android cell phone, I love coding games in Java and sharing the same code base for desktop and Android sounds cool (isn't that the reason why I looked at GameMaker:Studio? ;-)). Additionally I started to follow Mario Zechner, the creator of libGDX, on Twitter. And just recently he announced that libGDX can now also create HTML5 output! I'll have a look at libGDX over the next days or weeks and keep you posted! My trial project will be a port of 10 seconds to libGDX! It works! It simply works! So it took me 2 minutes to configure GameMaker:Studio to use my installed Android SDK, my Java JDK and to generate a keystore file for my GameMaker games. Afterwards I created a little test game (just some bouncing apples in a room enclosed with walls) and hit the "Run" button. GameMaker:Studio started compiling and deployed the game to my Android phone which was running with USB debugging enabled and connected via cable. Just seconds later I could "play" this little test game. Even changing orientation of my phone worked. But honestly, this is a pretty cool 2D cross platform development tool. Hats off, YoYo Games! [Real life] Is this site dead or what??? But today I spent some time and wrote a few things up. Hopefully you won't have to wait this long until the next update! If you want to develop games for Windows, Mac, Web, iOS and Android for free you couldn't do better than to jump over to http://unity3d.com/ and get the free version of Unity (including Windows, Mac and Web) and get the base modules for iOS and Android for free!!! But hurry up, the offer ends at April, 8. Here is the direct link to the Unity store: https://store.unity3d.com/index.html. Just select the free Unity version plus the two modules and check out. A registration email containing the serial number will be sent to you. Recently I got an email invitation to the beta test for GameMaker:Studio. Basically GameMaker:Studio is the generic version of GameMaker:HTML and it allows you to generate Windows and Mac executables plus HTML5, iOS and Android games if you buy the proper modules. GameMaker:Studio without modules will cost 99$ and each module will cost 200$ (which is a bit too expensive if you'd ask me). Luckily all purchasers of the GameMaker:HTML version (currently available for 99$ too) will get GameMaker:Studio plus the HTML5 module for free. So if you purchase GameMaker:HTML now you'll get the improved version for free plus Mac export (Windows and HTML is already included in GameMaker:HTML). So currently I'm trying to test the Android code generation which is enabled for a limited period in the GameMaker:Studio beta (but apk generation is not so you have to use debug tools, a wire connected Android phone and so on). Sounds like a simple (but not cheap) approach to get cross platform 2D game development with a really sophisticated game dev oriented IDE. Kev Glass has moved the Slick source repository over to http://www.bitbucket.org and passed the development responsibility over to several guys that want to help improve Slick.